All about scrapbanking and buying regular weapons and class tokens. Guide: How do I scrap my weapons? I want to sell weapons for metal, how do I turn my weapons into scrap? This is the weapons page. 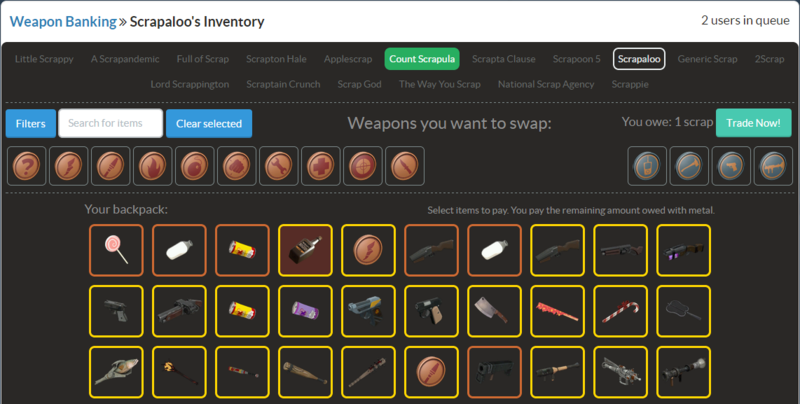 Click on the "Scrap Weapons" button to begin. Here you choose the weapons you want to buy. I've selected a Tomislav and a Back Scratcher. To the left you can filter your weapons if you for example only want to see Scout or Heavy weapons. To the right you'll see how many scraps you'll get for your weapons. You're now in the queue to get your weapons scrapped. You can see the queue at the top of the screen. I'm currently in a "global queue" which is what you'll be in at the start. 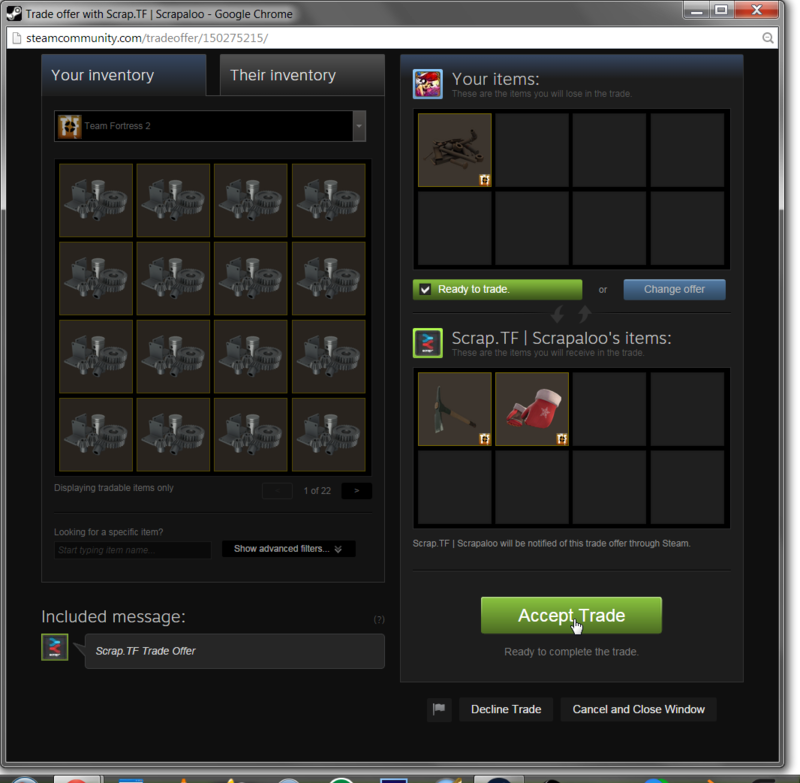 Then you'll be assigned to a bot to trade with it. You might be in a queue for a minute or so. You can see what the trade needs to look like. 1 scrap metal for my two weapons. Now this will pop up. 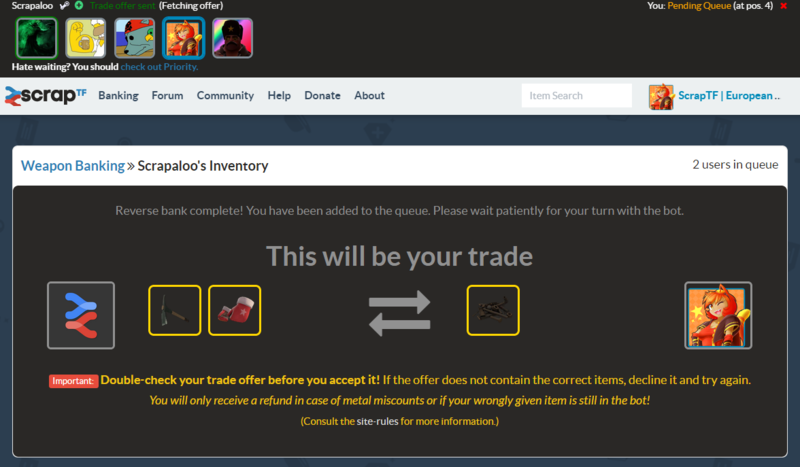 Click the green "Go to trade offer"
You'll now get into a trade. Simply accept the trade if everything is alright. When the offer is alright and has gone through then the trade will be closed. You'll now see this. You now have your metal. Simply close it by clicking the white X at the top right of the box. You've now succesfully completed a weapons trade! Congratulations! It's basically the same with all the other trades but you can always go and check those tutorials as well. Guide: How do I buy weapons? I want to buy weapons for metal, how do I buy weapons? This is the weapons page. Scroll down a little and you'll see all the bots. This is a bot. Click on it to see all the weapons it has. Here you choose the weapons you want to buy. I've selected a Escape Plan and a Holiday Punch..
To the right you'll see how many scraps you'll have to pay for the weapons. Now you'll see this. Here you can choose if you want to trade your weapons for the weapons you selected before. 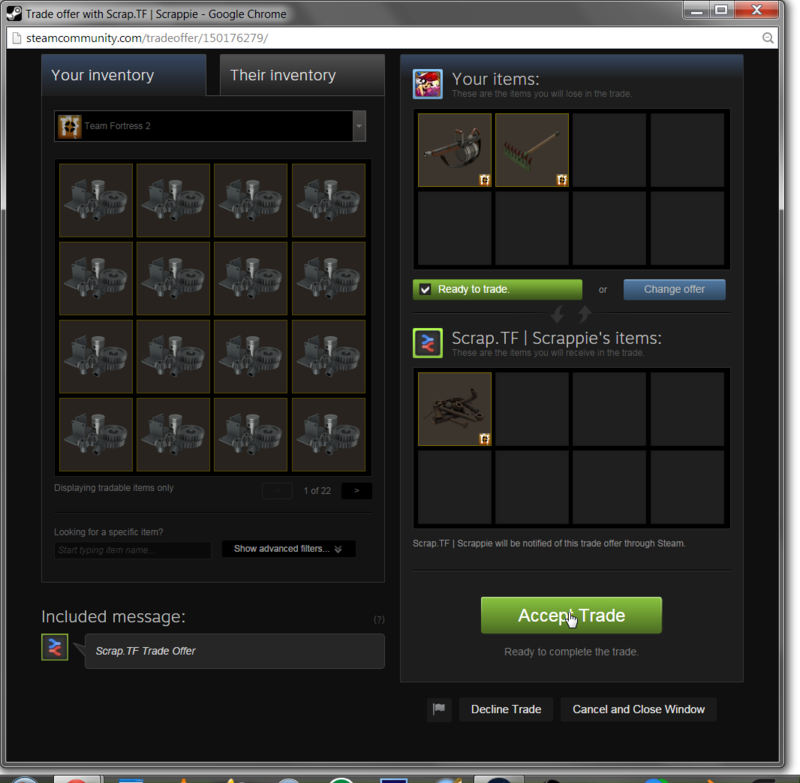 I want to pay a scrap for the two weapons so I don't select anything and hit the "Trade Now!" button. You're now in the queue to buy the weapons you selected. You might be in a queue for a minute or so. You can see what the trade needs to look like. 2 weapons for my 1 Scrap metal. You'll now see this. You now have the weapons you wanted. Simply close it by clicking the white X at the top right of the box. It's basically the same with all the other trades, but. You can always go and check those tutorials as well. What does the option of autoscrapping duplicates do? This option automatically sells your duplicated weapons for metal so you don't have to slowly select one by one manually. What does the option of autosmelting metal do? This option allows you to combine your metal without the need of opening the game. 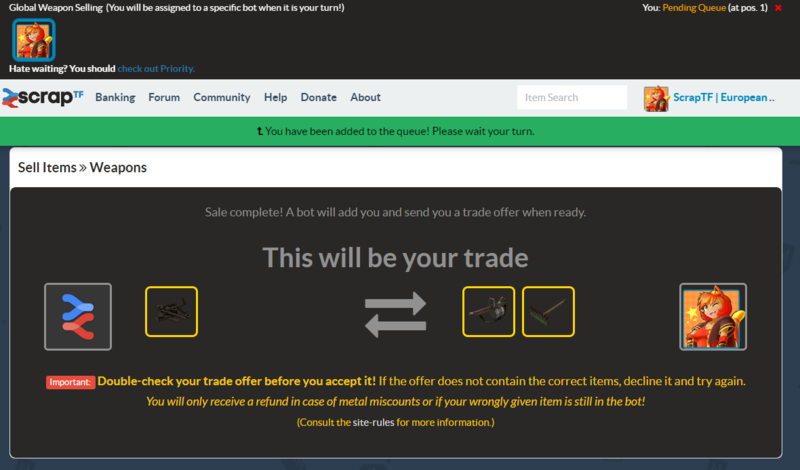 The bot doesn't have the item(s) that I want to buy! You will have to wait until someone sells that specific item to the bot. How do I search across the bots? 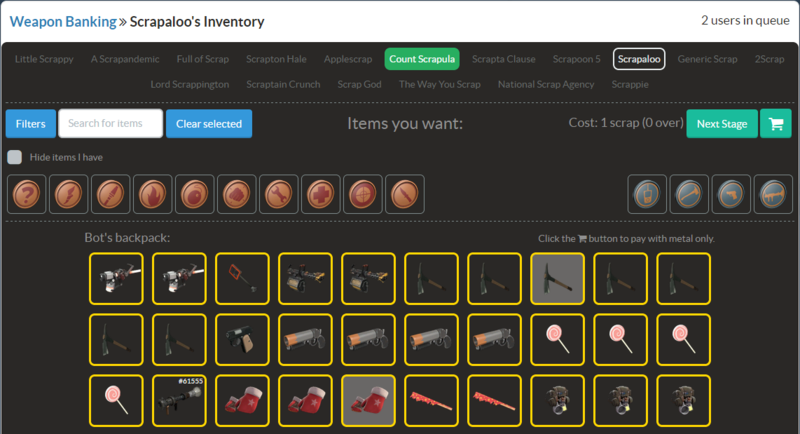 On the top right of Scrap.TF there is a search bar; type part of the item you want to find and it will list what bot(s) have said item. It's saying that the bot's backpack is full! Then you will have to wait until the bot gains more space by buying or selling (depending on what banking) items from/to the users. Staff will take action if it's needed, but we ask you to refrain from poking them about it every 5 minutes. It says that the item is reserved, what does that mean? Can I reserve any? When an item is reserved it means that someone else went to the bot's backpack, picked the item and now is in the queue (he's waiting to buy/get it from the bot). This is done so other people aren't able to accidentally steal other user's items. No, you can't reserve any by yourself. Items get automatically reserved as soon as you get in the queue for that item. No items show up when I select the buy option! This happens when all of the bots from the banking which you are trying to use are full, as we do not load full bots in the general view. You will have to wait until they have more space in their inventory. Also, if you are experiencing this in CSGO banking, then it's most likely because the skins which are tradable are not priced since they stopped meeting our pricing conditions, you will have to wait for them to meet our conditions again.